I use it to keep my backpack off the ground when I stop for lunch. Keeps my pack clean and dry this way. Remarkably lightweight for its strength. I bought these for stocking stuffers for 20-somethings. They were all discussing various ways to use them, so I think they were a hit. Wish I had gotten one for myself! So many uses for this...very sturdy and useable! I discovered the Qlipter by exploring Grommet. I purchased three a gifts and they have gone over well. Great for travelers. I keep one in my travel backpack now. 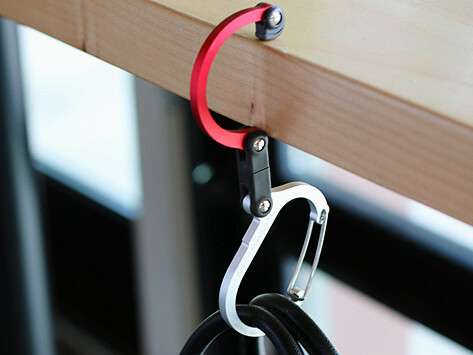 Great to use to actually hang my backpack when I do not want to sit it on the ground(city). I also take one and use it with my photo cases to hang. Great ideas come out of necessity! PS. Very high quality construction!!! Love it - I keep finding new uses & have not been disappointed. I bought this for my Rookie Fireman as a gift. He has not received it yet, but after looking at it, I would recommend this as a perfect tool for a fireman to keep with his/her bunker gear. It is tough, but looks very professional and so versatile!! I will also recommend it to our Dive Team, it's such a great idea!!! I got this clip to use attached to a hand made rope so that I could use it with my service dog in jobs like opening public doors. It is a big enough hook to fir around a door knob (a regular climbing hook is too small) and i can also attach the set to my purse when not in use. I hung it on the passenger seat of my car so I can hook my purse and not watch it fly to the floor when I make a quick stop. It's large enough to also add small packages for the same reason. Love it! It actually worked better than I thought it would. Will be purchasing more of these Quilters soon!